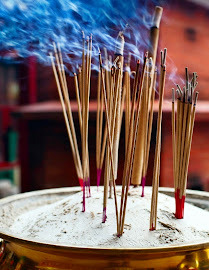 Blue Pearl is the essence of incense.The finest aromas nature could produce. Each scent has its own unique personality with a subtle delight of each classic fragrance. The first time you experience the aroma of Blue Pearl you will appreciate why it is considered one of the finest incense brands in the world. The most natural and purest way to heighten a mood for meditation, quiet time or freshen the atmosphere in any living area. This incense is named Blue Pearl for the brilliant blue point of light that appears during meditation.